Wind turbine noise being studied to death? This is in response to the September 1, 2012 article published by southcoasttoday.com regarding the Fairhaven industrial wind turbines (IWT). It is apparent that the Massachusetts Department of Environmental Protection (DEP) is way past due for making their decision about the Falmouth IWT noise levels. The DEP has witnessed the nighttime operation of Wind 1 and has sufficient noise level measurements to determine that Wind 1 is out of compliance. Under state law, wind turbines cannot increase the quietest nighttime dBA noise levels (L90) by more than 10 dB when compared to the maximum (Lmax) produced. Ariel Wittenberg, reporter for southcoasttoday, witnessed nighttime noise measurements for the Fairhaven Wind Turbine project. Noise levels were measured by the DEP’s Laurel Carlson accompanied by Sumul Shah, Project Developer. Carlson wrote down a long series of noise levels measured in 5-second increments; 47.8, 46.6, 47.7 and so on. This measurement methodology dates back to the 1970s, when sound levels were manually taken by viewing an analog meter needle movement. Statistical measurements require at least 100 readings with IWT ON and then OFF. Each hand-written measurement includes an identifier relating to the noise source heard. The 10th lowest value would represent the L90 or residual background; the noise level exceeded 90% of the time when turbines are OFF. The Lmax would be the highest value measured when the turbines are ON. A drawback for DEP methodology is that most of the noise levels are excluded by reading only once every five seconds. The DEP is correct to require an observer to listen and note every noise source so that non-IWT noise can be excluded. Sound meters are poor listeners, unable to identify a noise source, whereas the human has excellent identification capability. However, meters can compute statistical sound levels and record time histories for dBA, dBC, dBL and fractional octave bands. Instrument data is downloaded to computer spreadsheet programs for post analysis. Compliance can easily be determined using a time-history graph showing the IWT operating, and then shutdown, leaving only ambient background sound. Measuring this ON to OFF transition directly shows the difference between IWT-ON sound levels to background-only sound levels. Falmouth’s Wind 1 was measured ON and OFF by the DEP during the night of March 7, 2012. At the same time and locations, independent sound level measurements were made with a calibrated Type 1 precision sound level meter and the results are shown below. 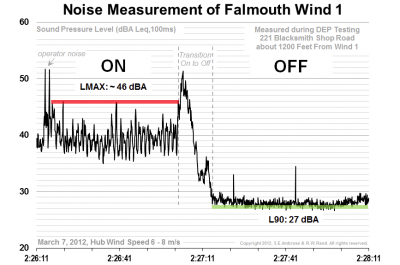 This graph includes sufficient information for the DEP to show that Falmouth Wind 1 does not meet state law; IWT-ON Lmax of 46 dBA in red and IWT-OFF L90 of 27 dBA background in green. The difference is 19 dB; 9 dB louder than the maximum allowed under state law. There is no doubt that this increase would provoke a very vocal negative reaction by neighbors. It should be noted that similar IWT-ON noise levels were recorded in Fairhaven (47.8, 46.6, 47.7) at similar hub-height wind speeds of 6.5 m/s (14.5 mph). These same noise levels have been measured at other wind turbine sites at similar distances in Maine and Massachusetts. Neighbors at Falmouth and Fairhaven have voiced their concerns about excessive audible noise and exposure to the adverse public health effects from infrasound and low frequency noise. The Falmouth Board of Health (FBOH) has acknowledged that there needs to an action to protect the public health, having received dozens of valid health complaints and testimonies. On June 11, 2012 the FBOH submitted results of their epidemiological study taken in the vicinity of the three Falmouth IWTs to the Massachusetts Department of Public Health (BPH) requesting immediate assistance. The FBOH wrote, “Due to the increasing intensity of the reported health impacts, the Board is considering emergency actions” and concludes with “We look to your Department, as that which holds the highest duty to protect health of citizens of the Commonwealth, to assist us in this matter.” After three months, there has still been no public response from the DPH. Neighbors are very concerned about the DEP and DPH studying IWT noise to death. They already have all the evidence they need. Now the Massachusetts DEP and DPH need to act to protect the public health, or just declare: IWT neighbors live in Public Health Sacrifice Zones. Source: Stephen Ambrose and Robert Rand, special to Wind Watch.